Bitcoin (BTC) has experienced about an 82% decline from 2017 all-time-high. After a very impressive performance last year, 2018 so far has turned out to be the exact opposite. At the moment, the question that weighs on the minds of investors and traders is; is Bitcoin dead? The cryptocurrency market experienced at a quick pace popularity in 2017 as quite a number of investors and traders thought the flagship cryptocurrency was the asset that guarantees an explosive profit. That, however, seemed undeniable at that time. Considering that at the start of 2017, BTC was only trading at $1,000, nevertheless, by December the price had rallied by about 1,880% to trade near $20,000. Moreover, Bitcoin gained nearly 250% between November and early December of 2017 alone, thus making the crypto market wildly popular. However, 2018 turned out to be different as the digital coin dropped by 82%, trading below $3,800 at the time of writing. At the moment, Bitcoin maintains over 50% of the crypto market dominance. This shows that the effect was felt across other cryptocurrencies, tokens and even mining operations. It is worthy of note, that in 2018, cryptocurrencies have lost 80% of their market values, thus prompting the market to question whether Bitcoin is dead. To answer this question, let’s take a look at the historical trends of Bitcoin from the yearly charts as they clearly show that such bear and bull markets are nothing new to the virtual coin. Notably, the ongoing bear market is not the worst so far, however, it has the potential to be. Additionally, Bitcoin’s gain in 2017 was also not the best that it had experienced. So far, the cryptocurrency had done far better than the last year’s performance and worse than the 2018 bears. Looking at the antecedent, Bitcoin was valued at just a fraction of a penny when it began trading in 2010. After getting out of the ‘cent zone’ to trade in the ‘dollar zone,’ early investors made huge profits when its price went through the roof in the years that follow. 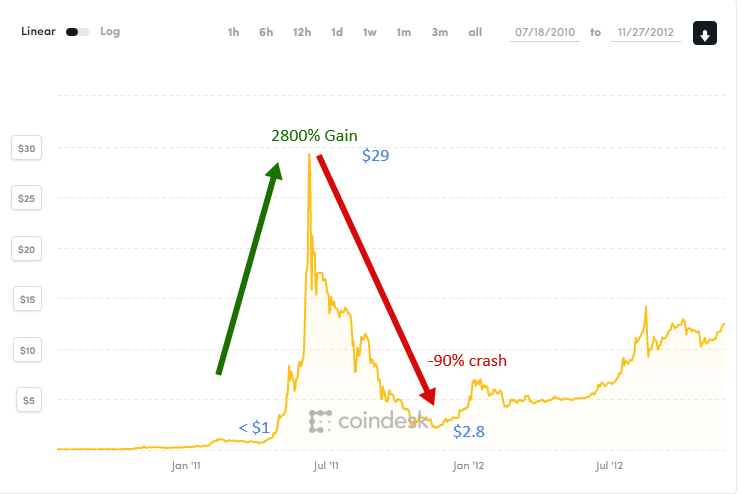 Bitcoin started the first big move back in April 2011 when it rose above $29 by July 2011, recording a 2,800% gain which is far more than the 1,880% gain seen in the year 2017. Shortly after the price reached the July 2011 peak, it had the first real bearish trend, dropping rapidly below $3 and accounting for more than 90% price decline. Moreover, the volume of trade was quite low in 2011 and there were no popular digital coin exchanges like we have today. Back then, the Japanese Bitcoin exchange, Mt. Gox was the largest Bitcoin intermediary and the world’s leading Bitcoin exchange, handling over 70% of the global cryptocurrency transactions. The next bear market occurred in the year 2013 after Mt. Gox suffered a series of cyber attacks. After Bitcoin declined to $2, it took about 2 years for the price to rebound and it would later trade around $100 from late 2012 to early 2013. The steady growth was maintained and for several months, Bitcoin traded between $90 and $140 before the second spike in October 2013. In November 2013, Bitcoin had its first shot at $1,000 after about a bullish run since October 2013, from the price level of $125. It soared at the time to $1,120, making about an 800% gain. Soon afterward, the cryptocurrency experienced its second bearish phase with an 84% decline to $175. This collapse took place between November 2013 to January 2015 when most of Bitcoin trading was still done on Mt.Gox exchange. After a series of cyber attacks, the exchange was eventually frozen out of the US banking system by regulatory bodies. The company went belly-up and then stopped all trading activities, closed its website and then filed for bankruptcy. After the chaos caused by Mt. Gox, Bitcoin regained its stability in the following years and steadily found its way to the top once again. For the rest of 2015 and all of 2016, the virtual coin recovered and climbed close to the $1,000 level. Last year, the upward trend continued and Bitcoin had its second-highest gain in history. The price rallied to its all-time-high in 2017, from roughly $1,000 to $19,800 by December 2017, marking the biggest ever profit in dollar values, as the gain was +1,800%. If you count its bullish run from January 2015 to the end of 2017, Bitcoin has gained a remarkable 11,200% in just less than 3 years. 2018 | Any Hope of a Price Rally? By the end of 2017, market capitalization had gone very high and was projected to hit $1 trillion in 2018 if it maintained the 2017 trend. However, the market turned bearish in 2018. In market capitalization, nearly $700 billion has been wiped off and the ongoing bearish move has resulted in losses in dollar values. Nevertheless, there are two things to take note of during the previous declines. Bitcoin price never dropped below the previous low but usually got very close. In this case, however, there are two possible lows — $1,000 and $175. This means that the ongoing bearish move might see the price getting close to $1,000. The price never lost 100% from the previous top. This means that Bitcoin never lost all of its profits made previously. In the 2011 decline mentioned earlier, it lost about 90% from $29 to $2.8. 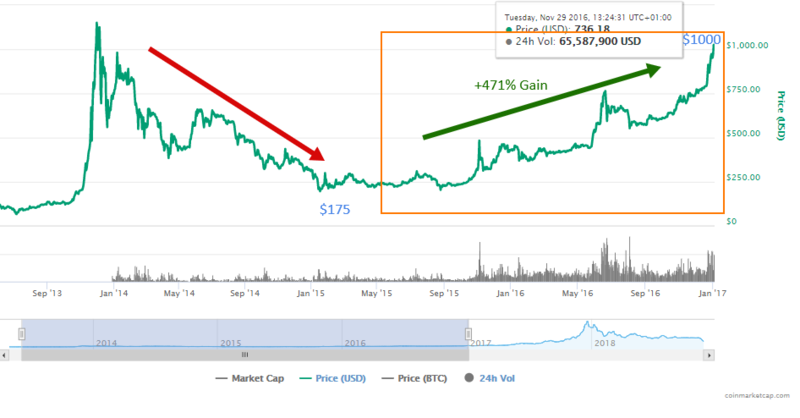 In the second decline between 2014–2015, it lost 84% from $1,120 to $175. The current decline, since the start of 2018, is about 82%. Hence, if the current downswing persists at 85% and 90%, then we can expect the price to dip to $3,000 and $2,000 respectively. Whereas, a dip below $2,000 to $1,500 would mark the biggest price slump ever for Bitcoin. Historically, the base should be $1,000. It is very much likely that the current slide is going to continue since the factors believed to contribute to the bearish trend are yet to be addressed. The major causes in the first two bearish market were cyber attacks. This time around, other factors played a more important role, such as regulations, a decline in mining operations, crypto firms filing for bankruptcy, and a lack of trust among investors and prospective investors. Hence, the bearish fire is yet to be extinguished. When analyzing the price of Bitcoin from the technical perspective, the decline from $19,800 is emerging into a pattern that is well recognized— an Elliott wave Zigzag pattern. The first leg from $19,800 to $6,100 completed a leading diagonal that is between the last two weeks of December 2017 and the first week of February 2018. Since this drop, the price has been range-bound to complete a triangle pattern. The bulls, for about 9 months, held the price above $5,800, despite several attempts to break below it. Finally, the bulls threw in the towel and the sharp sell-off continued as expected. 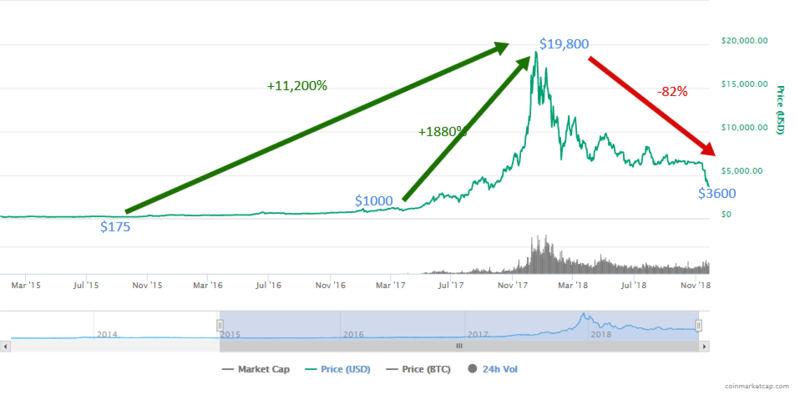 By way of projection, the price could head towards $1,000—$2,000 in December 2017/January 2018 unless a fast break happens back into the $6,000—$7,000 zone. Based on the two historic behaviors mentioned above, the second expects a price support between $2,000—$3,000 before it commences the next phase of a bullish trend. If the price goes with the first historic behavior, then $1,000 and $175 would be the supports levels. In the previous bullish rally, the price hit $29, $1,120 and $19,800. 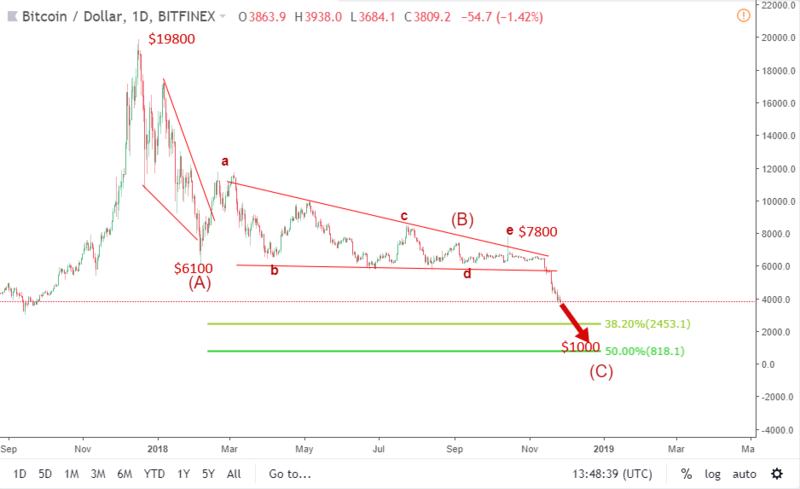 We can expect that the next bullish trend may be slower and less than the previous but it’s very much possible to hit $150,000 if the price would repeat its previous behaviors. With strong institutions, strict regulations and more high-net-worth investors throwing their full weight behind the cryptocurrency, the cloud of pessimism around BTC and other cryptocurrencies might just disappear paving the way for a new wave of healthy spikes. The next bullish trend—if it happens—could take a much longer time than before, nevertheless, it is unlikely that Bitcoin will completely vanish. The question once again; is Bitcoin dead? No! It may be considered dead if the price goes below $175 as that would invalidate its previous behaviors. Often times, price patterns and behaviors are repetitive over time.